GameShark is the brand name of a line of video game cheat cartridges and other products for a variety of console video game systems and Windows-based computers. Currently, the brand name is owned by Mad Catz, which marketed GameShark products for the Sony PlayStation, Xbox, and Nintendo game consoles. Players load cheat codes from Gameshark discs or cartridges onto the console's internal or external memory, so that when the game is loaded, the selected cheats can be applied. When the original GameShark was released, it came with 4,000 preloaded codes. Codes could be entered, but unlike the Game Genie, codes were saved in the onboard flash memory and could be accessed later rather than having to be reentered. The cartridges also acted as memory cards, with equal or greater storage capacity to the consoles' first party memory cards. It was originally released for the Sega Saturn and Sony PlayStation consoles in January 1996. It was a runner-up for Electronic Gaming Monthly's Best Peripheral of 1996 (behind the Saturn analog controller). Models for the PlayStation had an Explorer option that allowed gamers to access most PlayStation disc files, and it was possible to view FMV files stored on the CD. The later models of the GameShark also had a Use Enhancement Disc option. The Enhancement Disc, which InterAct sold for $4.95, allowed users to upgrade the GameShark and add codes to the code list from the disc. Only a few examples of these Upgrade CDs were known to have been published. The PlayStation Gameshark had the following standard features: View Video Image, which allowed users to see the last image stored in the PlayStation's Video RAM, View CD Image, which allowed a user to search the game CD for image files, Play Music, which would play the CD audio, and View CD Movie, a function that allowed a user to view FMV (full motion video) files found on the disc. Also included was the option to use an Enhancement CD in order to upgrade the Gameshark and add new codes found on the disc. The GameShark Pro series contained a feature that allowed players to find their own codes. During gameplay, the user presses a button on the device to open a code search menu. Finding a code is done by searching memory locations either for specific values or for values that have changed in a certain way (increased, decreased, not changed, etc.) since the last search. After the first search, subsequent searches only look at memory locations that match the specified criteria from the last search. By performing multiple searches the list of matching locations is gradually reduced. Once the list is reasonably small the user must determine which of the found locations is the correct one by modifying them one at a time and seeing what effect it has on the game. In some games the resulting code may only work in one level or it may cause problems in other parts of the game due to memory locations being dynamically assigned. In these cases the user has two options: attempt to locate a pointer to the data block that their code is attempting to modify, or change the game's programming which is usually located at the same place every time. If a pointer is found, and the device supports it, a new code can be made which determines the correct location to modify from the pointer. If the device does not support pointers the game programming must be changed instead. Generally the user must use external tools to find the code that accesses this data. If the code is reading from memory it may be changed to read a constant value; if it is writing, it may be changed to not perform the write. These changes may not have the same overall effects as when actually modifying the game's code. For example, a user may disable the routine that causes the player character to lose health when touched by enemies, only to find that health is still lost from other hazards. One of the many Gameshark products was the one for the Nintendo 64. The Nintendo 64 GameShark was the most popular cheating device available for the system, becoming popular after well-known titles such as GoldenEye 007 and The Legend of Zelda: Ocarina of Time were released. Because of the complex nature of these games, there were many aspects of them which could be modified to produce unique effects. For example, unused content was discovered such as a distant tower on the "Dam" level of GoldenEye 007. The Nintendo 64 Gameshark Pro featured an in-game code search menu. Versions 3.1, 3.2 & 3.3 had a parallel port on the back, allowing the device to be connected to a PC with a program called SharkLink. This was intended primarily to make entering large amounts of codes easier, but was also used for advanced hacking. The in-game code search required that an Expansion Pak be installed and that the game did not actively use the Pak for memory. The PlayStation Gameshark Pro contained much of the same functionality as the standard PlayStation GameShark, as well as unique features only found on the Pro. The advanced features were: Code Creation, which gave users the option to save newly created codes to a standard PlayStation memory card to share with others, and V-Mem (Virtual Memory), which gave users access to an onboard Memory Card feature where they could store up to 8 full memory cards worth of saves. The Shark Link software suffered from the same problems that plagued the N64 version. The final firmware/software update for the Playstation GameShark Pro hardware was version 3.2 (v3.2), which was made available on physical media titled "The BigWave 4". With the introduction of the 9000 model of the PlayStation, the parallel port was removed. This had been the only way to use the GameShark, as it plugged directly in to that port. InterAct then created a GameShark that did not need it. The GameShark CDX came with a boot CD along with a card resembling a standard memory card, which stored the codes. Even though the CDX could be upgraded, it is not known if InterAct created an upgrade for the CDX. The CDX is not compatible with either PS2 system. The GameShark 2 was very much like the CDX Game Shark that came out for the original PlayStation, but for the PlayStation 2. It even included features that could only be found on the GameShark Pro, but like the CDX Game Shark that came out for the original PlayStation codes could be saved to a memory card, one which resembled that came with the CDX version. It was released the Fall of 2000 and included a CD-only Game Shark 2 for the original PlayStation 2 containing over 14,000 codes. Released in 1998 for the Game Boy and Game Boy Color. Preloaded with codes for 158 games, but unfortunately, new codes could not be saved. It did however contain a feature called Game Trainer, which was a way to create new codes. Memory Erase was an additional feature which allowed users to clear all saves from a Game Boy cart. The GameShark for the Game Boy can also be used with the Game Boy Advance, as long as the cart connected is either for Game Boy, or for Game Boy Color. It cannot be used for Game Boy Advance carts. The original Game Boy GameShark could be used with the Game Boy Color, which it predated. However, due to the low height of the outside cartridge slot, the connected game cartridge would be pushed outward by the Game Boy Color's battery compartment, which, unlike those of previous Game Boy models, curved outward from the rear surface of the device. 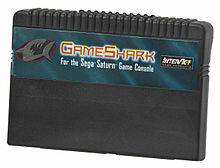 The later GameShark Pro featured a longer cartridge which held the connected game cartridge higher so as to avoid this flaw. The GameShark Pro for Game Boy allowed for saving new codes. Almost as soon as the GameShark made its appearance on the store shelves, new codes began to appear in the gaming magazines of the day. In order to create more interest as well as a way to get the word out on their new products, InterAct created a newsletter called 'Dangerous Waters' (which was published eight times a year starting in 1996 and featured new codes), a phone number which players could call for the up-to-the-minute latest codes, and a website with exclusive codes that could only be accessed by those with a full Dangerous Waters membership. GameShark.com also first appeared on the net around this time. Due to the increasing popularity of Dangerous Waters, it went from a black and white 8 page newsletter to full color bimonthly by 1999, and featured game reviews as well as tricks. Then, in June 2000, Dangerous Waters was transformed into a full-fledged magazine called GameShark Magazine and continued to be published bimonthly, reaching up to 20 pages long and containing many more codes. However, due to problems with Mad Catz, GameShark Magazine ceased publication with the Holiday 2001 issue. This last issue was a double issue, containing the last GameShark Magazine issue, as well as a special issue by IGN as it was their 2001 Buyer's Guide. It featured new games and systems that were available at the time. It also included a Game Shark CD Sampler disc which featured codes for the PlayStation 2, as well as a handful of game saves. When the Game Boy device was first released, InterAct acquired the rights to sell Datel's Action Replay and Pro Action Replay devices in North America; these devices were sold under the GameShark and GameShark Pro names. InterAct released GameShark devices for the Game Boy, Game Boy Color, Game Boy Advance, PlayStation, PlayStation 2, Saturn, Dreamcast and Nintendo 64. After InterAct's parent company, Recoton, went bankrupt, the rights to the GameShark name were acquired by Mad Catz, who relinquished the North American Action Replay distribution rights. Following this, Mad Catz sold game save devices under the GameShark name instead of the traditional cheat device, and Datel marketed the Action Replay in North America directly. Since acquired by Mad Catz the original site for Gameshark has been shut down, and no products associated with Gameshark have been sold on their site. ^ a b "Cheating Comes to 32-Bit Systems". Electronic Gaming Monthly. No. 78. Ziff Davis. January 1996. pp. 88–89. ^ "32-Bit Game Busters". GamePro. No. 88. IDG. January 1996. p. 23. ^ "The Best of '96". Electronic Gaming Monthly. No. 92. Ziff Davis. March 1997. p. 90. "GameShark Products". Mad Catz. Archived from the original on 2006-10-19. Retrieved 2006-10-25. "GameShark Duo - for NDS, Game Boy Micro, GBA SP". Mad Catz. Archived from the original on 2006-08-10. Retrieved 2006-10-26. This page is based on the Wikipedia article GameShark; it is used under the Creative Commons Attribution-ShareAlike 3.0 Unported License (CC-BY-SA). You may redistribute it, verbatim or modified, providing that you comply with the terms of the CC-BY-SA.